In 2001 I suffered from a severe case of mercury poisoning due to the unsafe removal of a "silver" filling by my dentist. It was very difficult to find the cause of my sudden illness, because few health care professionals are aware of the symptoms. Now I dedicate part of my time to warning others about "silver" mercury amalgam dental fillings. Introduction Marie's Story is updated with video. Dr. Boyd Haley Interview on the Dangers of 'Silver' Amalgam Mercury dental fillings. MercuryExposure Interviews with scientists, doctors, dentists, and victims of mercury poisoning exposeé the cover up of mercury's link to many diseases. DAMS members join with a dentist, neurologist and a consumer attorney to participated in the International Mercury Expo at the College of William and Mary, April 22-25th, 2010. You can see the standard response from the American Dental association at Setting the record straight on dental amalgams. New House Bill H.R.4615 titled the CHOMP Act of 2009 was introduced into the House on February 4, 2010. The CHOMP Act of 2009 would require informed consent before dentists place any restorative dental work. Bills on dental mercury never leave the Committee on Energy and Commerce and always die in committee. One Hour Video on Vitamin D by Dr. Mercola. It is imperative to get vitamin D levels in optimal range to protect from many diseases. KJ's Story 15 year-old poisoned by mercury fillings KJ's Story A 15 year-old boy is poisoned by mercury fillings. The warnings that the mother referred to on the FDA website saying amalgams could be dangerous for children under 6 or for pregnant women WAS REMOVED from the FDA web site as of July 28th, 2009 when the FDA classified amalgam fillings as a Class II device. Did your dentist show you the warning label on your mercury dental fillings before he placed them in your mouth? Amalgam Warnings Oh, he didn't? Then why do you continue going to a mercury using dentist who doesn't give you a choice. If he doesn't tell you mercury is in a filling, you do not have informed choice. Biocompatibility Testing of Dental Materials Don't jump from frying pan into the fire. Take this test before amalgam removal. Expressing the need for enhanced public awareness of potential health affects posed by mercury, House Resolution 648, was cosponsored by 32 members of the House of Representatives, but later eleven members withdrew their support. It has been referred to the Committee on Energy and Commerce, subcommittee on Health. You can see how much money the American Dental Association is giving to members of the House of Representatives. Could that be why the anti amalgam bills submitted by Congresswoman Diane Watson have sat in this committee year after year going no where? 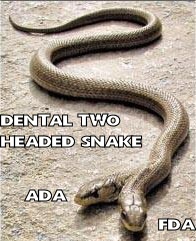 Dental Two-Headed Snake-Snakes have not had a very good reputation in the history of the Judeo-Christian tradition - sneaky, slimy, slithery, poisonous - snakes and serpents spell trouble. Jesus identified religious hypocrites in his day with with the symbol of snakes, calling them a "brood of vipers." They deceived the people because they were the "professionals." We have institutional hypocrisy today in Government regulatory agencies like the FDA (Food and Drug Administration) and trade groups like the ADA (American Dental Association). Snakes would rather lie than tell the truth. That is why you have to corner them, sue them and make them do what is right. And you thought these groups were there to protect you? New Regulation Result of Lawsuit Settled Last Year, but will it be enough?? Will amalgam be banned? Will it be classifed as a Class II device with limited warnings? Or will it be classifed as a Class III device that would require the FDA to PROVE its safety before leaving amalgam on the market? As we found out on July 28, 2009, the FDA turned against promises made in binding arbitration to Charlie Brown (the attorney who sued them, see toxicteeth.org,) pulled warnings off their web site about possible neurological damage to children and unborn children when the mother is exposed to mercury. FDA classified amalgam as Class II, with few meaningful warnings. FDA Calls for Stricter Controls on Mercury Fillings. What controls? Dentists are still free to tell patients they have allergies when patients are actually poisoned, and dentist still don't know how to safely remove mercury fillings. Dr. Susan Runner, of the FDA, lying, reported the FDA has reports of only 140 adverse events from amalgam in 20 years, when victims have written the FDA with THOUSANDS of reports of MERCURY POISONING over the YEARS. 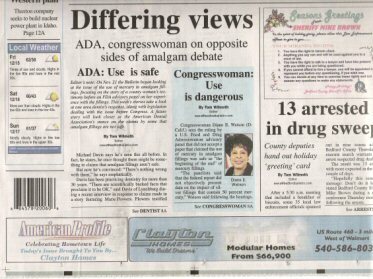 Here are comments before and after the 2006 FDA hearings. The FDA only posted 234 out of 2,500 comments submitted because they are "understaffed". If they would ban mercury in dental fillings, it would tremendously cut down on their case load and they wouldn't have to conduct all those useless hearings. Should people have their amalgam fillings removed? Contact DAMS, Dental Amalgam Mercury Solutions for an info packet at 1-651-644-4572. Talk to Leo Cashman. Be safe, don't rush out and have fillings removed unsafely! Get Your Head out of the Sand. Get Informed. Enroll in Medical Webinars with Dr. Eisenstein. Don't be a Dummy! Want to know about vaccine dangers, vaccine waivers, statin drugs, new Vitamin D levels, cutting edge medical and legal information? Enroll in Free Webinars with Dr. Mayer Eisenstein. Dr. Mayer Eisenstein was one of the speakers at the recent Chicago Health Freedom Expo. His practice, Homefirst Health Services, has over 20,000 families under its care with virtually no children with Autism, Asthma or Diabetes. "I recognize that these are serious epidemics affecting more than 5,000,000 children in our country. Since 1973, we have given families a choice with regard to childhood vaccines and now over 90% of our families have opted not to vaccinate their children." It seems after much fanfare there really was not a swine flu epidemic. Mike Adams reports on the hoax in H1N1 swine flu hoax falls apart at the seams. See "30 Stricken by Paralysis Following Swine Flu Shots" from the old newspaper, Eugene Register-Guard, December 15, 1976. Some called it creeping paralysis. 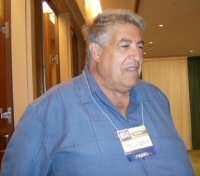 Dr. Garry Gordon from Arizona said he treated several people in the '70's who were paralysed from the swine flu vaccine. Numbness started in the feet and crept up the legs to the body. When the numbness reached the chest and the patient could no longer breathe, they were placed on respirators. Dr. Russell Blaylock, Neurosurgeon, was almost kicked out of the military for refusing the swine flu vaccine in the '70's. "I was in the military during the first swine flu scare in 1976. At the time it became policy that all soldiers would be vaccinated for swine flu. As a medical officer I refused and almost faced a court martial, but the military didn�t want the bad publicity. Despite the assurance by all the experts in virology, including Dr. Sabin, the epidemic never materialized. For more of Dr. Blaylock's story. CBS 60 Minutes documentary on the swine flu epidemic of 1976 where Judy Roberts, now known as Judy Woodruff of the PBS News Hours contacted Guillain-Barré syndrome and suffered some facial and other paralysis. Hundreds of Thousands of Reactions to Gardasil Vaccine! Is Your Child Next? a video presentation by Neurosurgeon Dr. Russell Blaylock on his YouTube channel. At the Health Freedom Expo in Chicago, Dr. Blaylock said those with neurological diseases needed 2,000 mg of DHA per day. Watch Dr. Blaylock in an interview on the health TV show "Your Health with Dr. Richard and Cindy Becker." The subject of the interview was Neurological Threats from Diet, Heavy Metals and Vaccines. From England--MERCURY IS IN THE NEWS! Holistic Dentist Dr. John Roberts of the UK featured on UK television Click on video. What's in Your Mouth? Bristish TV Exposé on Mercury Fillings. Dentist, staff and patients use special precautions to avoid mercury vapor exposure. Toxic Teeth, Fresh debate over use of mercury in the mouth by Amy Mastin. Angie's List Warns Subscribers about Mercury Fillings. FDA Finally Issues Warnings about Amalgam Fillings, Must Classify Amalgams by July 2009. "....It's the retraining of some of the dinosaurs that may still be teaching [in the dental schools] that is the obstacle." 25 Member Advisory Panel Rejects FDA Safety Report on Mercury Dental Fillings! Mercury Poisoned People Testify at FDA hearings. See their pictures. Read their testimonies. Some Panel Members say, "Stop using mercury dental fillings in pregnant women and children." Dr. Russell Blaylock, neurosurgeon, says "excessive stimulation of the brain�s immune system as a result of too many vaccinations can destroy mass quantities of brain cells and connections..."
Subscribe to the Blaylock Wellness Report His report has been a great source of information for me. VIDEO Freya Koss appears on television in Philadelphia about mercury fillings Philadelphia now requires patient informed consent concerning Hg fillings. New Update 2009 Small Smiles Dental Clinic is Hiring in Roanoke, VA Bonuses are promised to dentists. Media reports in video below show the policy of Small Smiles is to give bonuses for putting in unnecessary baby root canals and crowns in children and to stap children down with Papoose Boards. And the Virginia Dental Association is allowing them to advertise on their web site! Small Smiles AD on VA Dental Association Web site. Share this information with your neighbors! My Comments on the Small Smiles Dental Clinics Does your pediatric dentist use MERCURY dental fillings? Names of Pediatric dentists in Roanoke who use MERCURY. 60 Minutes Video from 1990, Is There a Poison in Your Mouth? go to their graves repeating their ADA propaganda. Festus says, "A vaccine a day keeps the profits okay." with Internet Radio Host Stan Kurtz of "From the Children's Corner School." ChildrensCornerSchool.com. The American Dental Association Reverses its Position on Mercury Separators by Charlie Brown. Poor can't afford dental work. Reverend Kenneth Copeland and Dr. Don Colbert Talk About Mercury Fillings and Vaccines Watch the TV show online! You can now read the Comments to the FDA about poisoning from amalgam fillings as the FDA posts them. They are very slow! Over 2,000 Flood FDA with Reports of Illness from Mercury Dental Fillings, but FDA still claims problems are "rare." Read the comments here. The CDC Finally Admits Autism is a Greater Danger to Your Children by Dr. Mercola. Incidence is now 1 in 150, up from 1 in 166. The CDC, Vaccines and Autism Dr. Paul Offit, propaganda machine for vaccines' "safety," claims thimerosal should never have been removed from vaccines. 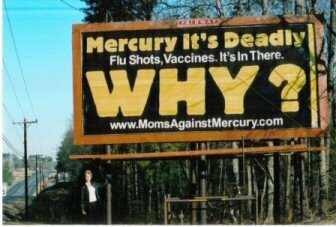 Anne Dachel says, "What the news networks don't tell us is that maybe all these endless population studies are damage control--a desperate attempt, after the fact, to disprove a scientific fact: Mercury is the second deadliest element on Earth and a known neurotoxin." Also see Why are They Afraid to Look? Let Tom Wilmoth know if you appreciate his article in the Bedford Bulletin. Tell him if you live in Bedford County or surrounding areas. See the tee shirt close up. More Mercury Stories from the Bedford Bulletin below. Correction for the Roanoke Times article- We did not picket the General Assembly. DAMS leaders in Virginia tried to get an informed consent law about dental mercury passed by the General Assembly. Marie's Story of Mercury Poisoning the original long version of my story with important links. The Burning Brain, Its Cause and Cure? The Dental Amalgam Issue--"It's a Snake Pit of Deception." 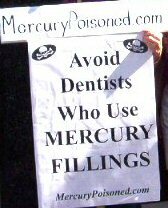 Dentists are Disciplined & Gagged for Warning Patients About Mercury Fillings. Academy of Oral Medicine and Toxicology. Text of video in PDF format. David Kennedy, DDS website and blogspot. Mercury on the Mind by Donald W. Miller, Jr. M.D. Lynchburg dentist supports use of amalgam fillings Dr. Michael Davis in Lynchburg "discounts" testimonies such as mine who say we are poisoned. When did a dentist's ideas take preference over a medical doctor's diagnois that I was suffering from "heavy metal toxicity?" Congresswoman Watson claims use is dangerous Congresswoman Diane E. Watson (D-Calif.) sees the ruling by a U.S. Food and Drug Administration advisory panel, that did not accept a paper that claimed the use of mercury in amalgam fillings was safe, as "the beginning of the end" of mercury fillings. Tom Wilmont wrote in the December 27, 2006 issue of the Bedford Bulletin, "This is the third installment of stories in a series looking at the debate surrounding the use of dental amalgam fillings." Pictured on the right: Charlie Brown, general counsel of Consumers for Dental Choice and Linda Brocato, a woman near Chicago who was mercury poisoned from her dental fillings. She now has MS. The Bedford Bulletin Looks at the Debate Surrounding the Use of Dental Amalgam Fillings A close up view of the front page. The Next Step After hearings raised questions on its paper, opponents say the FDA now has to choose the next step. Tom Wilmonth interviews Charlie Brown and Dr. Boyd Haley. 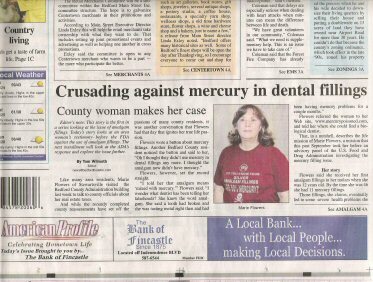 Mercury Free A Growing number of dentists choose not to use dental amalgam, including Dr. Frederick Smith, a biological mercury free dentist in Lynchburg, Virginia. Dr. Smith is a member of The International Academy of Oral Medicine and Toxicology, a group of mercury free dentists, alternative health doctors and scientists who research the effects of toxic materials in dentistry. They strive to use materials that are bio compatible with the body. The IAOMT has developed a protocol to use while drilling out mercury fillings that will minimize the patient's exposure to mercury vapor. You can read Dr. Frederick Smith's editorial to the Bedford Bulletin. 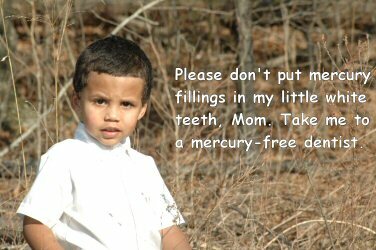 Pediatric dentists and most of the Roanoke dentists are still not mercury free. Old fashioned dentists are still putting mercury in children's teeth. If fillings are silver or grey colored they are 50% MERCURY! Dentists' offices may tell you their amalgam (silver) fillings do not contain mercury. Amalgam means "mixed with mercury." Don't be fooled! There are mercury free dentists in Roanoke who will take children. To not exceed EPA "safe" levels of mercury in the flu shot you would have to weigh 550 pounds. How Do You Spell Fear? FLU Goverment Agencies--Lying to you about Vaccine Safety. FDA Claims flu shots safe, even with mercury! 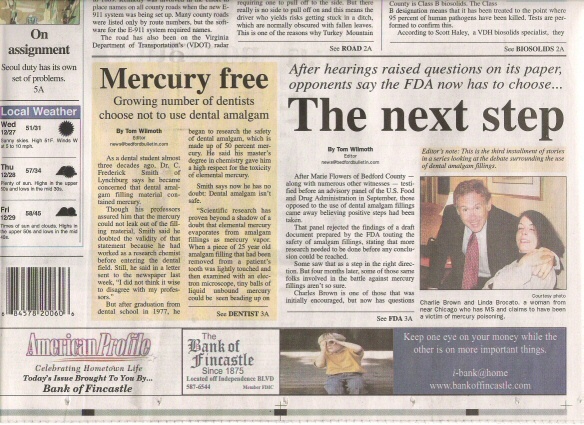 Dr. Boyd Haley Exposes the Phony Science on Amalgam "Safety"
What's Wrong with the October 2003 NEJM Article on Mercury? DAMS Leaders Picket the Virginia Dental Association Annual Meeting We picketed the dental meeting in Norfolk. Poisoned Dentists Diane Meyer, DDS of Downers Grove, IL was told "It's Your Hormones, Honey! How Modern Medicine Killed by Brother by Dr. Russell L. Blaylock, M.D. Protection from Fluoride and Mercury Toxicity by Dr. Russell L. Blaylock, M.D. Federal Legislation "Mercury in Dental Fillings Disclosure and Prohibition Act"
A Call to Action, Let Us Ban Mercury Dental Fillings! 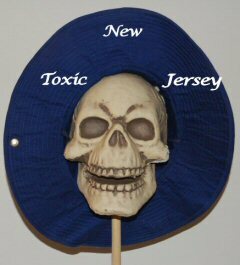 Congressional Hearings on Mercury -"Consumer Choice and Implementing Full Disclosure"
The Testimony of Sandy Duffy Portland Attorney Challenges the "Gag Order"
Suffolk Co (NY) HHS Meeting on Thimerosal See the video. More video links on my links page. 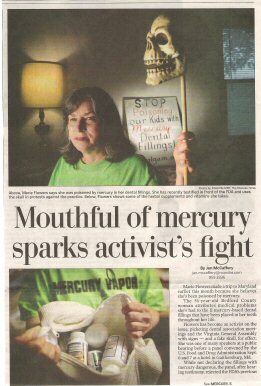 Mercury in the News Help Ban Mercury Fillings! If you copy information from my web site, please provide a link to the source of the information. Readers are welcome to contact me about your stories of being mercury poisoned. I especially want people in the Roanoke, VA and southwestern part of Virginia to contact me if you have had mercury poisoning symptoms after receiving dental care. I can give you referrals to biological dentists and alternative health doctors in Virginia, North Carolina, and South Carolina. If you would like information and names of biological dentists, please contact the mercury education group DAMS (Dental Amalgam Mercury Solutions) for an information packet and dentist referrals at 1-651-644-4572. The main web site for DAMS is www.amalgam.org. I am one of the DAMS Coordinators (activist) for the Commonwealth of Virginia.